Did you know that July is Smart Irrigation Month? We’re kicking off one of the hottest seasons in Florida with a 10% discount on qualifying water conserving irrigation products like low-flow nozzles, pressure regulated popups, and WiFi links that help reduce the use of this precious resource. We’ve been thinking a lot about water conservation and water quality lately. Maybe it’s because its been raining nearly every day since April (and we still see systems running during storms!) or maybe its because the desert-like heat and humidity has us dreaming of the cool relief of running through the sprinklers. Either way, we’ve got something to say about water use. Your irrigation system is one of the biggest offenders for waste. We want to help you change that during Smart Irrigation Month. The bottom line is that any improvements to your system will ultimately result in just a little more cash in your wallet. 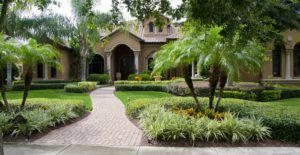 The side effect is that you’ll be doing something great for the environment and your community by making sure that your irrigation system functions properly and to its greatest potential. Zone mapping: Create different zones based on water use. Your lawn doesn’t need as much water as your flower beds, and drought tolerant plants require dry spells to thrive. Each of these should be treated as separate zones. Dripline: It’s easily hidden under mulch, easily repairable, and it targets the root zone. Watering plants overhead, especially in our climate, can lead to issues with fungus and insects. Avoid these problems with dripline that provides water slowly at the plant’s root zone. Low-flow nozzles with pressure regulated popups: These are a pair. Low flow nozzles provide similar benefits to dripline in that they deliver water at a lower rate allowing for maximum absorption. Your landscape absorbs water slowly. These mitigate runoff and waste. Rain sensors: This small but mighty device is not only required on your automatic irrigation system, it’s probably one of the biggest water savers in Florida. Because of our high frequency of torrential downpours it makes sense to have a sensor. These tell your system not to run when its already had enough water thanks to Mother Nature. Water wise controllers: The next generation of irrigation controllers. These units collect satellite data and use that to manage the irrigation system by overriding cycles based on weather patterns, shutting off zones when a leak or problem has been detected, and much more. DID YOU KNOW? Total Sprinkler & Lighting has joined up with 1% For The Planet to get a portion of our revenues to organizations helping mitigate some of Florida’s water issues. That means that when you work with us, a percentage of your purchase goes to projects like rebuilding reefs off our coast which help to improve water quality. Even small changes to your system over time will help. Every bit counts. We at Total Sprinkler & Lighting are always happy to answer questions or assist with a repair. Keep checking back for new and exciting information on emerging technology aimed at making your irrigation sprinkler system water efficient.